Jessica Dofflemyer is an artist, writer, photographer, and mother living on a small Hawaiian island. Her blog, "For the Archives," began as a 40-day experiment to chronicle everyday experiences raising her six-year-old son on her own. What evolved is now a collection of prose, poetry, and photography that seeks to find the profound in the mundane details of daily life. Dofflemyer's blog has archived over 700 postings and has been featured as a Wordpress "Freshly Pressed" selection. 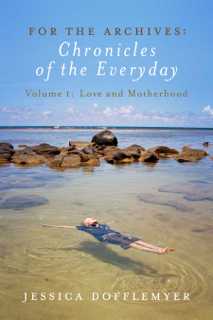 Her photography has been published in the Pacific Writer's Connection anthology, "Ho'olaule'a: Celebrating Ten Years of Pacific Writing," and she continues to post her daily chronicles to the Archives at forthearchives.wordpress.com. Her photography and art can also be viewed at forthearchives.net.